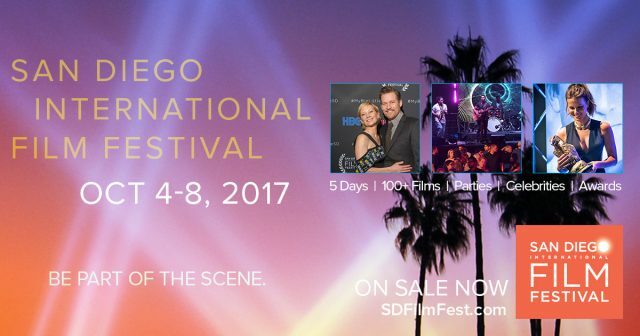 San Diego Intl Film Festival, Oct 10-14 – What Not To Miss! Tiger Woods will be there, will you? 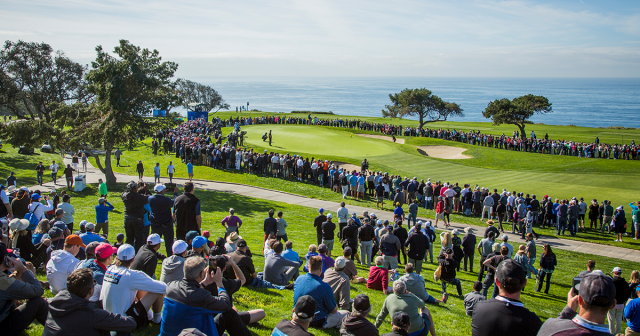 The Farmers Insurance Open returns January 25-28 to Torrey Pines Golf Course. 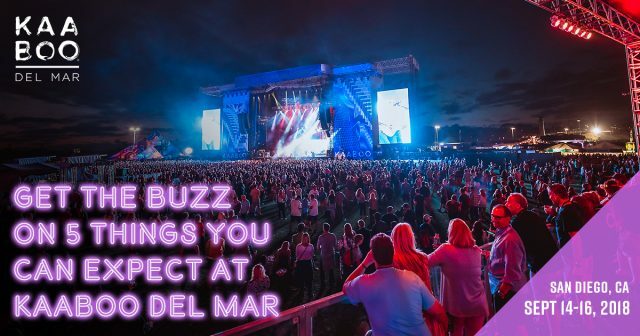 Come out to enjoy the ocean views, world-class golf, an array of specialty food and drink offerings and open-to-the-public fan attractions. When the play ends, keep the party going with live music from local DJs and Happy Hour drink specials. From general admission to a VIP experience, there’s a ticket option for everyone. Daily ticket options range from $50-$385 for an all-inclusive experience. 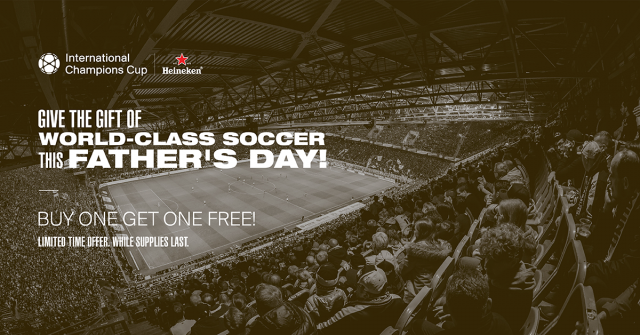 Senior, kids, youth and Military discount ticket opportunities available. 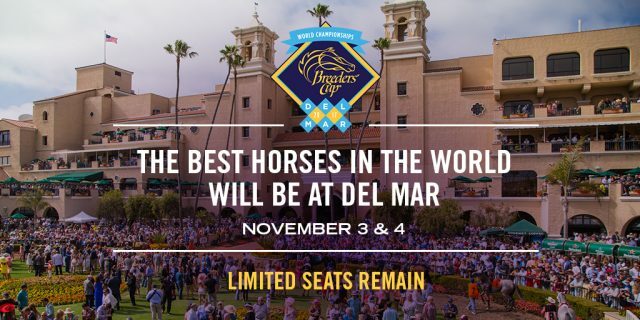 The 34th Breeders’ Cup World Championships comes to Del Mar for the first time ever on Friday, November 3 and Saturday, November 4, 2017. 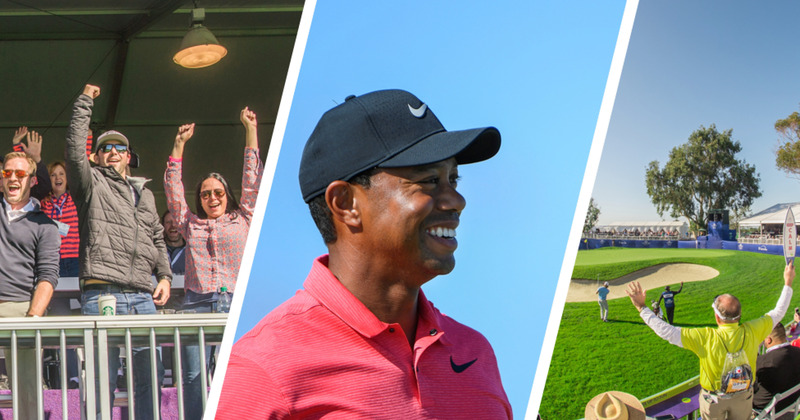 The beautiful Del Mar racetrack will host the sport’s richest event, 13 championship Thoroughbred horse races worth more than $28 million, attracting the best racehorses, trainers, and owners from around the globe. But there’s more to Breeders’ Cup – a week of festivities, fun, and events add to the thrills found on track. Since 1984, the world’s best in Thoroughbred racing have competed at the Breeders’ Cup. Beginning as a one-day event with seven races, the Breeders’ Cup has grown into a two-day horse racing extravaganza that has seen legends born, history made, and fortunes won. The 2017 Breeders’ Cup will be held at the Del Mar racetrack just north of San Diego. 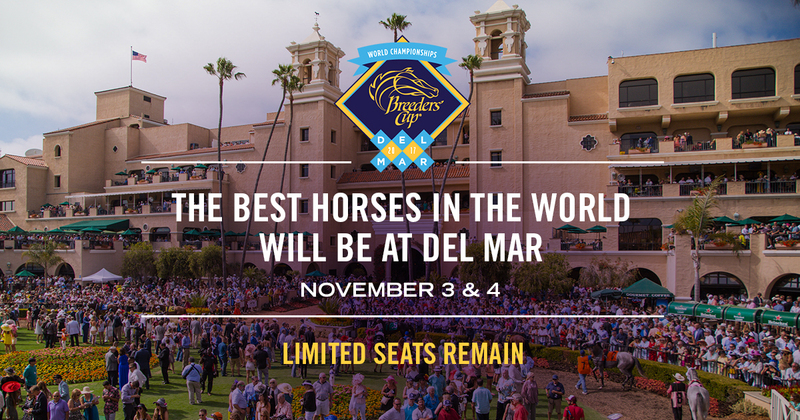 Limited tickets are available for the Breeders’ Cup. 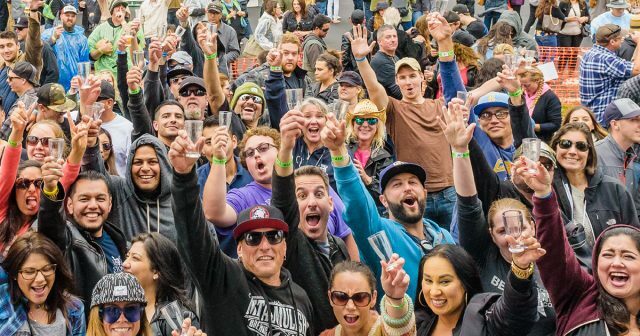 Experience Taste of Breeders’ Cup: San Diego with an Infield GA ticket. Two-day gourmet dining tickets are available in the Seabiscuit Skyroom and the Trackside Chalet. The Breeders’ Cup will be broadcast live on NBC Sports Network and NBC on November 3 and 4. Visit the Breeders’ Cup Watch page for a complete viewing schedule. To get a bet down on the Breeders’ Cup, visit TwinSpires.com or visit your local simulcast facility. 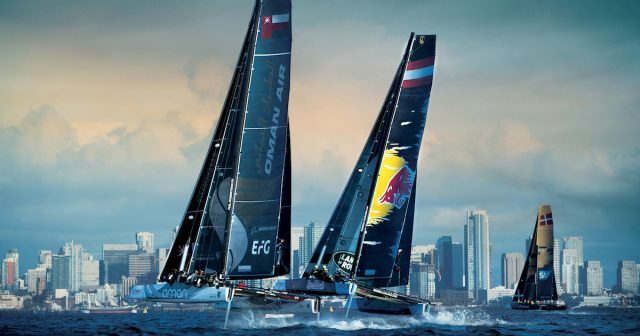 For the first time ever, the Breeders’ Cup will run where the turf meets the surf. The Breeders’ Cup Festival is a week-long celebration of the event running from October 28 to November 4. Join us for Breakfast at Breeders’ Cup, racing at Del Mar on Wednesday and Thursday, and the La Jolla Art Walk. Seek out the vibrant Breeders’ Cup Art of the Horse, 20 life-sized sculptures of racehorses placed throughout the San Diego area, designed by local artists inspired by Thoroughbred racing and the local culture. If you love film & the movies then join us for the very best in independent filmmaking at the San Diego International Film Festival. We will be screening world premieres, documentaries, shorts and not-yet released films from the studios. From star-studded tributes to intimate moments with filmmakers to the best parties on the festival circuit San Diego’s premier film festival has something for everyone – 140+ films to choose from, great parties and lots of opportunities to meet the creative filmmakers that challenge, inspire and entertain us. The VARIETY Night of the Stars Tribute brings Hollywood to San Diego for a glamorous evening of celebrations and awards. The Gregory Peck Award of Excellence in Cinema, 2017 will be presented to Sir Patrick Stewart and the Auteur Award will be presented to Kumail Nanjiani at the Pendry San Diego. Stay tuned for our other honorees! 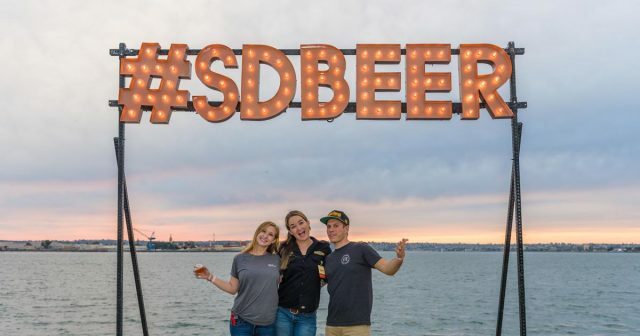 Mixing fun for a cause, the Friday Night Party with a Purpose in downtown San Diego is a perfect end to a full day of screenings. We kick off the night with a bang! There will be live music and art, entertainment, food trucks, complimentary beverages and games in the beer garden. > Kick off the weekend with a bang! We premiere some of the biggest films coming out of Hollywood and the independent film circuit. Come to the festival for a chance to see films like: Lion, Hell or High Water, Silver Linings Playbook, 12 Years a Slave and many others weeks or even months before they hit the big screen. San Diego International Film Festival features a slate of film tracks that reflect both the unique culture of San Diego and that fulfill our mission to “Make a Difference” with film. Tracks include Social Impact, Environmental, Military, American Indian and new this year Equestrian. Stick around after the film and listen to the filmmakers discuss the inspiration and creative process to get their film to the big screen. In addition filmmaker panels and our filmmaker awards show are exciting opportunities to meet and learn from these creative and successful artists. Enjoy a cinematic adventure into the world of food and then partake of delicious bites from local sustainable Chef’s and restaurants. Get Your Pass or Ticket Now!